Invoice is a document that is issued by the seller to the buyer. For an eCommerce store, it is especially important as it is one of the primary proof of transaction. Moreover, invoices will help sellers convey important information to customers relating to the order or store policies. So, it is important to be able to create invoices from your eCommerce platform itself. 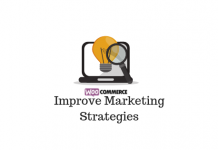 If you are using WooCommerce as your eCommerce platform, you will find a range of plugins to help you generate and customize invoices and other documents. In this article, we will list out some of the best free WooCommerce plugins to create PDF Invoices. First, let’s take a look at some of the popular free WooCommerce plugins to create PDF invoices. This is one the best Free WooCommerce Plugins to Create PDF Invoices in the WordPress plugin repository. With the help of this plugin, you will be able to add a PDF invoice to your order completion emails automatically. 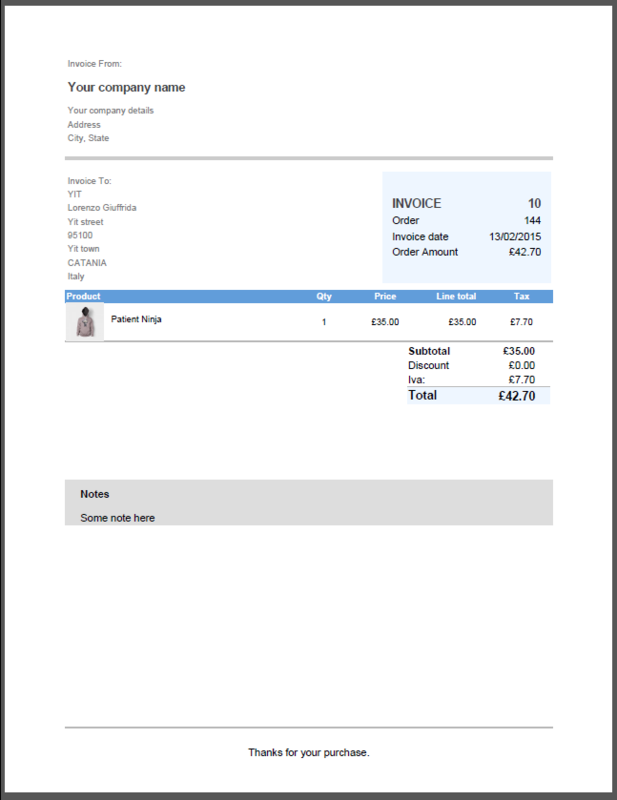 It also allows you to download the invoice from the order details page, along with a packing slip if required. The plugin provides a default template for your invoices. However, you can customize it to suit your site’s design themes, or even opt to create new templates. You can include the invoice inn PDF format in the order completion mail if this plugin is installed on your WooCommerce store. The plugin has a feature that would let you generate invoices and packing slips in bulk from your WooCommerce store. Customers will be able to download invoices from their My Account page as well. You can create a custom order to make your invoices in sequence. The plugin is fully customizable as the templates are HTML / CSS based. You will find more extensive customization features with the premium version of this plugin. This is another popular option among free WooCommerce plugins to create PDF invoices. It has more extensive features to customize your invoices according to your branding requirements. 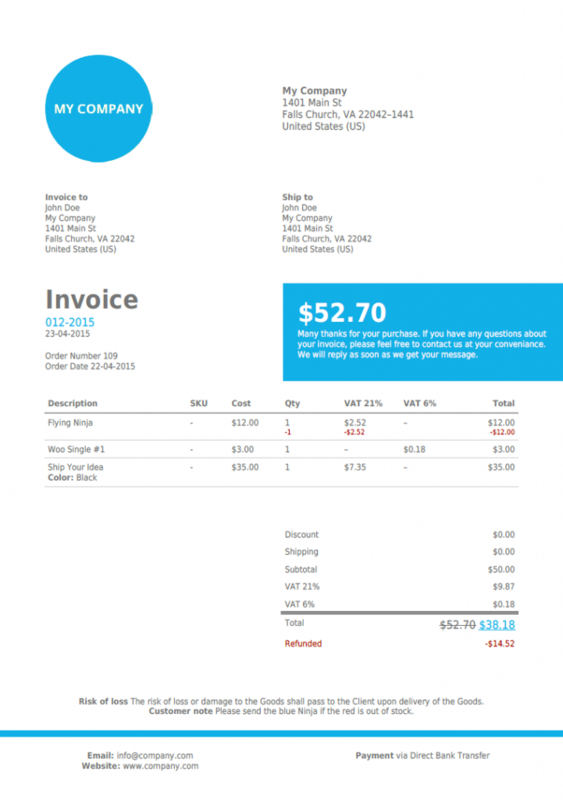 The plugin primarily helps you in printing invoices and delivery notes on your WooCommerce store. You can see the customization options are relatively better in this one. It allows you to personalize the invoice with your company name, address, policies, etc. With extensive customization options, this plugin has become one of the top among popular free WooCommerce plugins to create PDF invoices. Registered customers and store managers will be able to print the invoice from the order details page while this plugin is installed. It allows printing documents from the order list page as well. Another interesting feature of this plugin is that it will allow you to bulk print invoices and delivery notes on your WooCommerce store. In the emails that you send to your customers, you can include a link that will help them to print these documents. You can also set up sequential numbers for the invoices using this plugin. With hooks and functions.php support, the plugin lets you manage developer level customization easily too. Automating the process of invoice generation can really help in improving your store’s operational efficiency. This is another plugin that will help you in this department with a set of advanced options. The plugin helps you automatically send invoices to customers when they place an order on your site. What sets apart this plugin is that you can choose which email types you want to associate the invoice option with. The plugin also gives you a choice to send the invoice to a variety of cloud storage services to customers such as Google Drive, Dropbox, OneDrive or Egnyte. 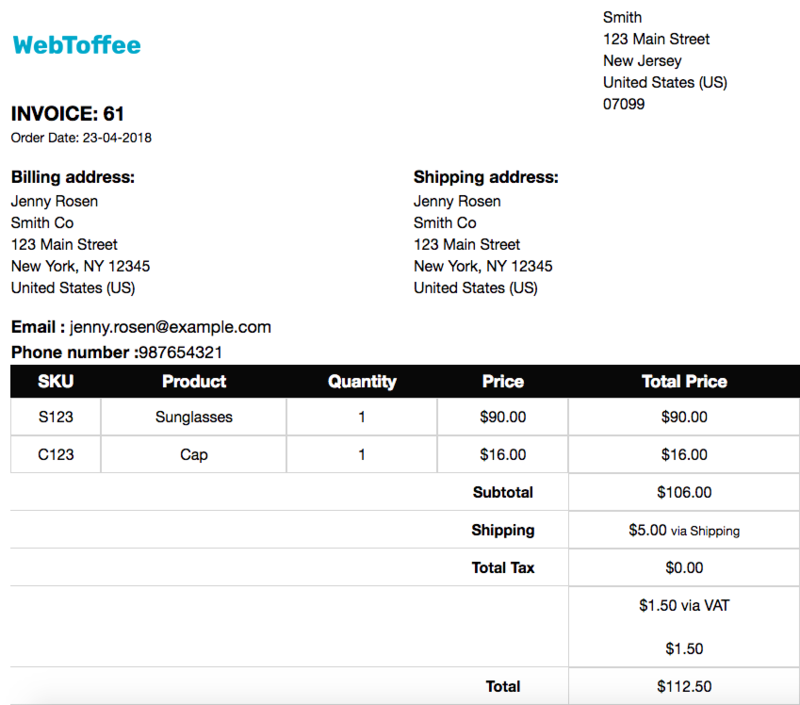 This is one of the interesting free WooCommerce plugins to create PDF invoices that will help you create a detailed invoice according to your store requirements. As the store owner, you will be able to create or delete an invoice manually from your WooCommerce store admin. As seen in other cases, this plugin too offers decent customization options for your invoice templates. It is also worth noting that the plugin offers multiple templates to begin with. You can also choose how you want to number your invoices using this plugin. Each invoice on your store will include aspects like tax rates, refunds, discounts etc., which are relevant for customers. This plugin helps you create customizable invoices and other documents on your WooCommerce store admin. You can choose the manual or automatic handling option while dealing with this plugin. You will be able to customize the number format of your invoices and even set a sequential progress for the order numbers. If you choose the automatic option, invoices will be generated on your store depending on the status of a particular order. The reason this one is among the popular free WooCommerce plugins to create PDF invoices is because of the flexibility it offers in the process of generating and printing PDF invoices. The plugin also provides an option to send the invoice as an attachment on one of the routine emails that you sent to customers. Customers will be able to download the invoices from the ‘Orders’ section of their My Account page as well. The plugin also offers extensive options for customization where you can modify invoice and shipping list templates. This plugin offers you an option to print multiple documents related to your WooCommerce order management and shipping. It helps you print invoices, packing lists, delivery notes and shipping labels directly from your WooCommerce admin. On all the documents that you generate on your store, you can include custom store name and logo. This will be a great option in branding perspective. This plugin helps to print shipping labels, delivery notes and packing slips as well and is popular as one of the most extensive free WooCommerce plugins to create PDF invoices. 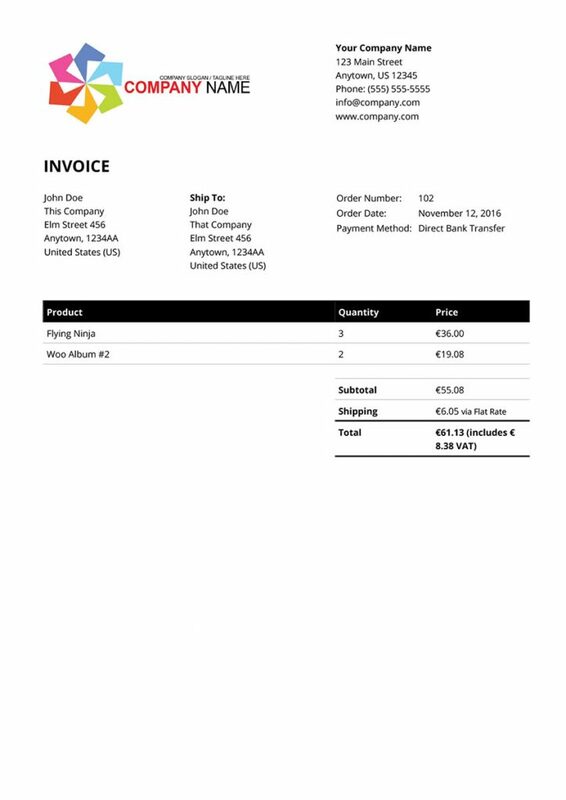 The plugin also allows you send the invoice PDF attached with the order completion email. Alternatively, you can download it from the order detail page too. You can also choose to bulk print multiple invoices from the orders page of your WooCommerce store. It offers extensive customization to handle invoice numbers. You can auto generate invoice number with prefix, suffix or padding. Also, you will be able to assign order number as invoice number, if that works for your store. Furthermore, the plugin offers an option to preview all the documents before printing them. This will help you better with your customization efforts. This is a WordPress plugin that helps you generate quotes and invoices on your site. You can send quotes and invoices to user so that they will be able to make payments on your store. Invoice payments will be supported by PayPal Express Checkout for online transactions, along with offline modes like check payment. You will be able to customize the title of the invoice as per your requirement. It also allows you to set up terms and conditions for your invoices, and also helps with invoice reporting. You can export your invoices into a CSV file as well using this plugin. You can generate quotes and invoices to accept payments using this WordPress plugin. This plugin also helps to create quotes to your clients, which they can choose to accept or reject. 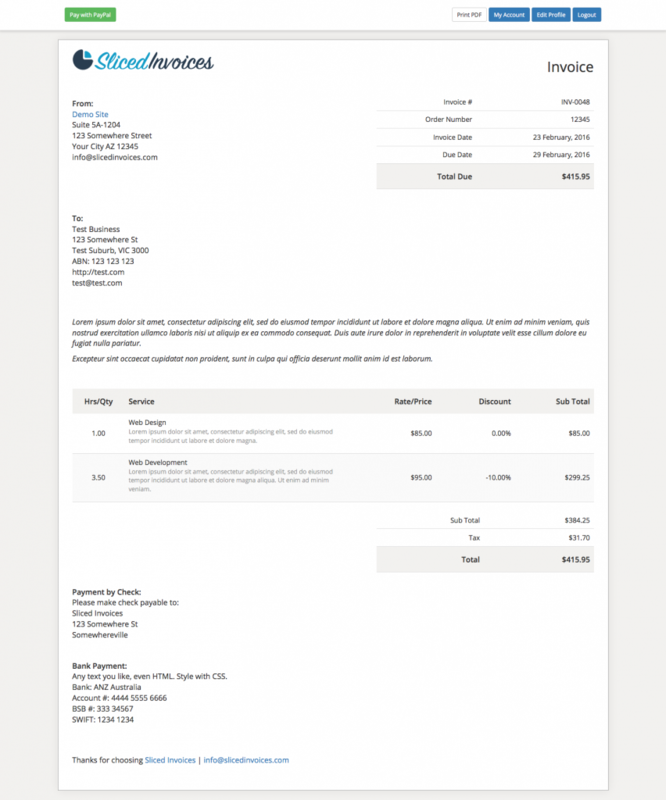 If accepted, you can easily convert quotes to invoices as well. You can also customize the quotes according to your specific requirements. When you create an invoice, you should make it clear what it is. Invoices can be of different types such as pro-forma invoice, self billing invoice, credit memo, debit memo, etc. It can also be a Commercial Invoice, which is a customs requirement for international shipping. Based on the nature of the document, you should clearly name it on your store. Invoices can be important documents for your bookkeeping requirements. So, following a proper numbering pattern would clearly help you in organizing them better. Generally, eCommerce store owners follow a sequential numbering system to organize invoices chronologically. You can also make it more effective by adding prefixes or suffixes to the number. Most of the free WooCommerce plugins to create PDF invoices mentioned in this article offers an option to customize the numbering system. When you generate an invoice on behalf of your WooCommerce store, you have to include proper details about your business. This means you probably have to mention your brand name, address, and even any required tax or registration codes. All these details will help in correct tax computation and better compliance to regional regulations. You have to include the information of the customer on the invoice as well. If you observe the pattern, most eCommerce stores will list the name, address and the email ids of their customers in the invoice. An invoice should clearly depict the details of the transaction. This may include several details like the product name, price, quantity, total price, etc. Furthermore, if there are any taxes, shipping charges, handling fees, etc., you can mention that as well. Discounts, coupons, cashbacks, etc., also need to be mentioned in the invoice, if applicable. Invoices can be generated before and after transactions. If invoice is generated before payment, you should mention all the available payment options. For invoices generated after the payment, you can simply mention the payment method used by the customer. Hope you got a clear idea on some of the popular free WooCommerce plugins to create PDF invoices. If you want more advanced customization features, you can also checkout the premium versions. Please leave us a comment if you have a query or an insight to share. 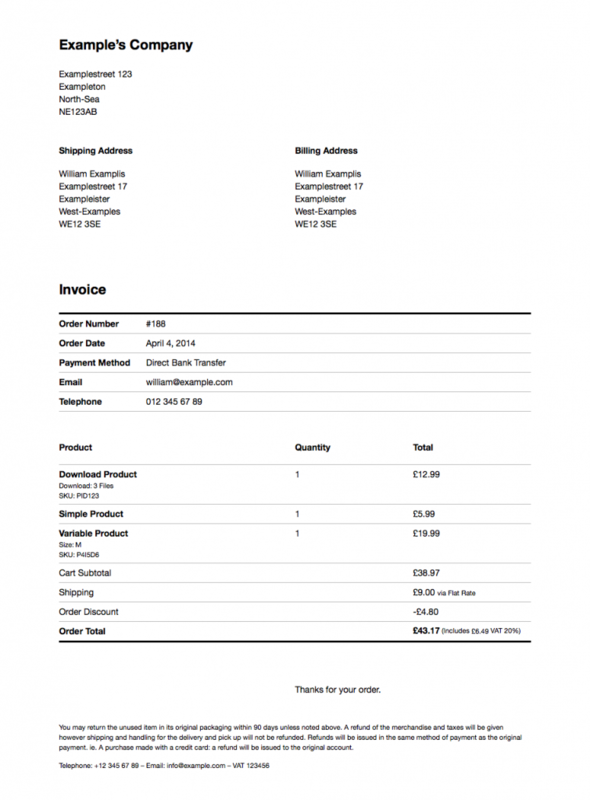 Best premium plugins to print invoices with WooCommerce. Shipping label printing with USPS on your WooCommerce store.